India said Tuesday that China should not interfere in its internal affairs, as the Dalai Lama began a weeklong visit to India's remote northeast that Beijing has protested. The Tibetan spiritual leader was greeted by cheering supporters as he arrived in Arunachal Pradesh. 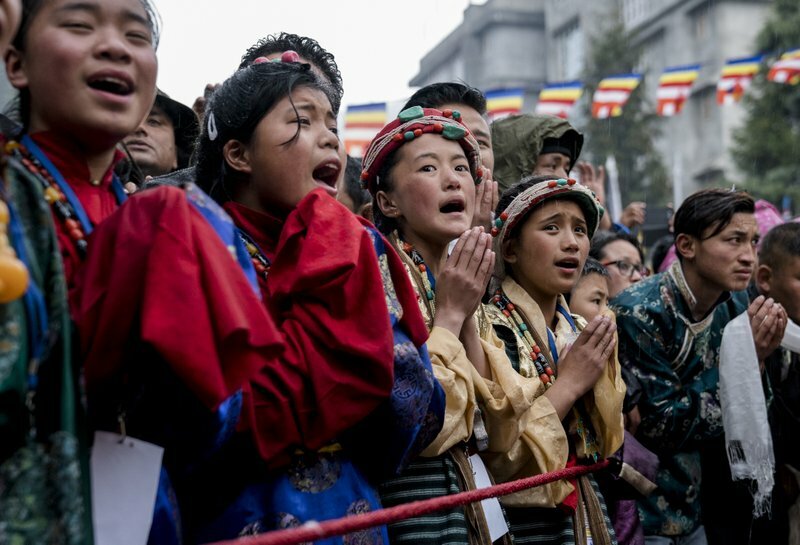 China claims the partly ethnically Tibetan Himalayan state as its own territory, and warned last month of "severe damage" to relations with India and increased regional instability if the Dalai Lama proceeds with his trip. Indian Junior Home Minister Kiren Rijiju said Tuesday that New Delhi respects Beijing's "one China" policy and expects China to accept India's policies. "Arunachal Pradesh is an inseparable part of India and China should not object to the Dalai Lama's visit and interfere in India's internal affairs," he said. The Dalai Lama is visiting the state at the invitation of the people of Arunachal Pradesh, Rijiju said. "As a democratic country, India cannot interfere in the religious affairs of any community," he said. 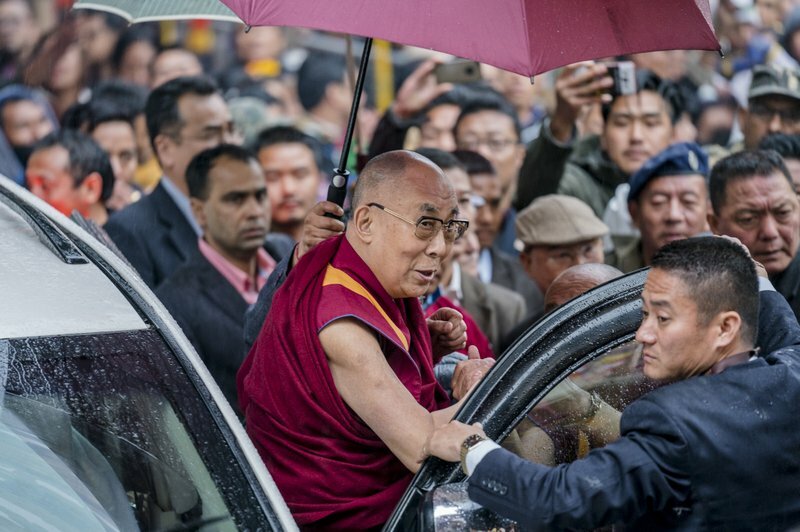 Hundreds of supporters, some waving Tibetan flags, cheered as the Dalai Lama's motorcade entered Bomdila, a town in Arunachal Pradesh that borders China. The Dalai Lama had to cancel his plans to fly to the state due to bad weather, giving people in Bomdila a surprise chance to greet their spiritual leader. This is the Dalai Lama's seventh visit to Arunachal Pradesh, and his first since 2009. Lama Tashi, a senior monk, said by phone from Bomdila that there was "tremendous enthusiasm among all of us here over the visit." "This visit is purely related to culture and faith, and there is no politics involved," he said. 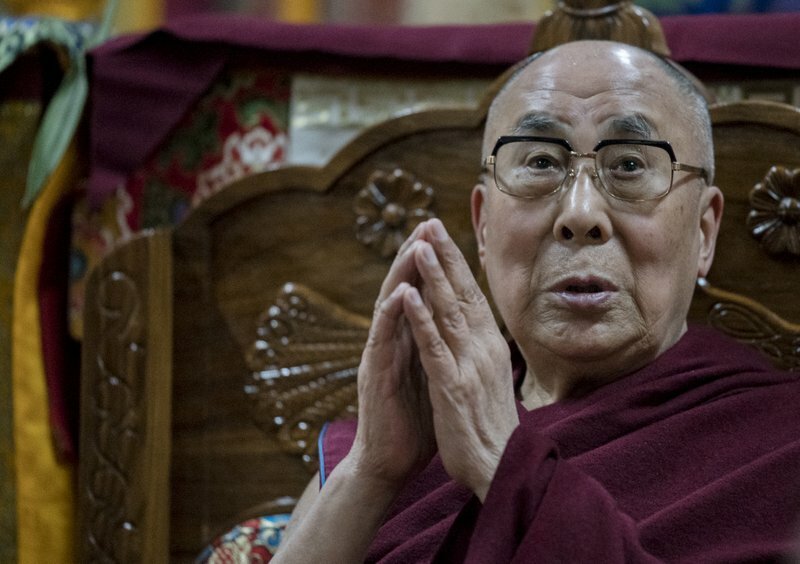 The Dalai Lama will travel to the Arunachal Pradesh district of Tawang on Thursday, where he is scheduled to consecrate a monastery and address his followers. People from nearby areas, including from the Himalayan country of Bhutan, which borders Arunachal Pradesh, were already gathering at Tawang, local officials said. 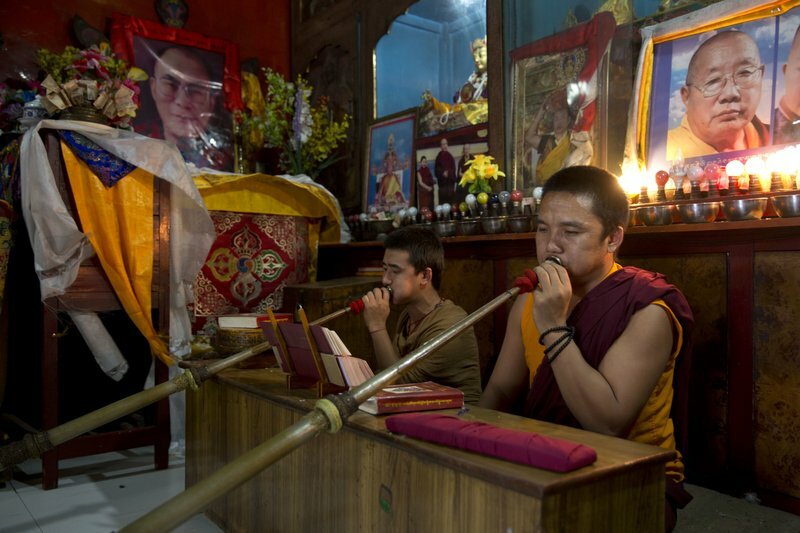 "The mood in Tawang is very joyous and spiritual," said Sonam Chombey, a Tawang official. Last month, Chinese Foreign Ministry spokesman Geng Shuang said that Beijing has expressed its concerns to New Delhi on numerous occasions and urged India to avoid offering a place for the Dalai Lama to carry out anti-China separatist activities. The frontier between the two Asian giants remains tense more than 50 years after they fought a brief but bloody border war high in the peaks. China claims about 90,000 square kilometers (35,000 square miles) in Arunachal Pradesh, referred to informally by some Chinese as "Southern Tibet." India says China is occupying 38,000 square kilometers (15,000 square miles) of its territory on the Aksai Chin plateau. More than a dozen rounds of talks have failed to make substantial progress on the dispute, although there have been relatively few confrontations in recent years. Exile Tibetan monks pray inside a temple in New Delhi, India, Tuesday, April 4, 2017. India said Tuesday that China should not interfere in its internal affairs, as the Dalai Lama began a weeklong visit to India's remote northeast that Beijing has protested. 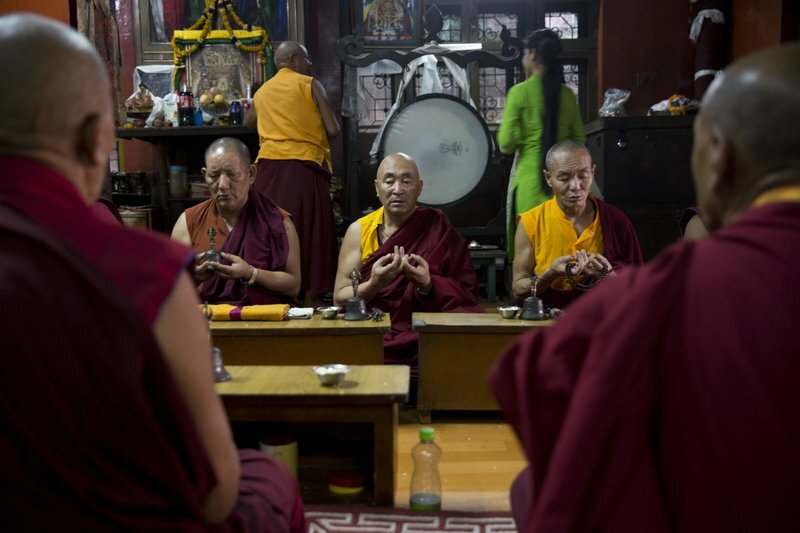 Exile Tibetan monks perform rituals inside a temple at Majnu Ka Tilla in New Delhi, India, Tuesday, April 4, 2017. India said Tuesday that China should not interfere in its internal affairs, as the Dalai Lama began a weeklong visit to India's remote northeast that Beijing has protested. 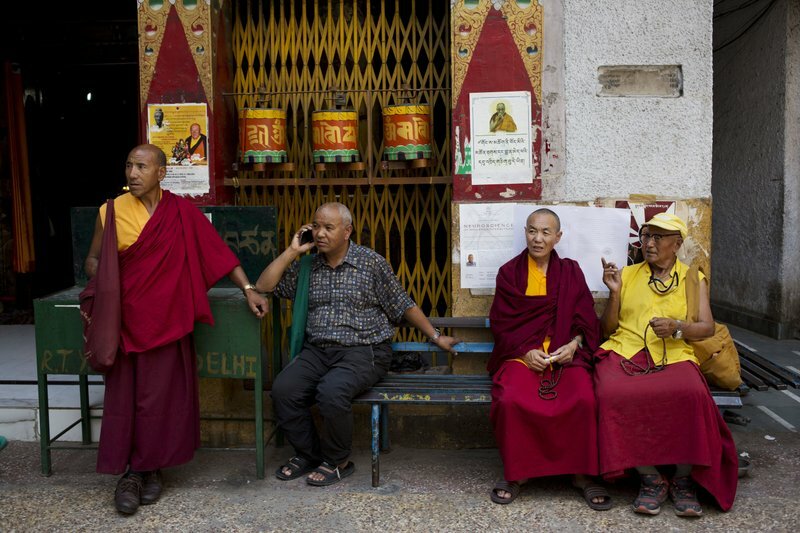 Tibetan monks sit on a bench outside a temple at Majnu Ka Tilla in New Delhi, India, Tuesday, April 4, 2017. India said Tuesday that China should not interfere in its internal affairs, as the Dalai Lama began a weeklong visit to India's remote northeast that Beijing has protested. 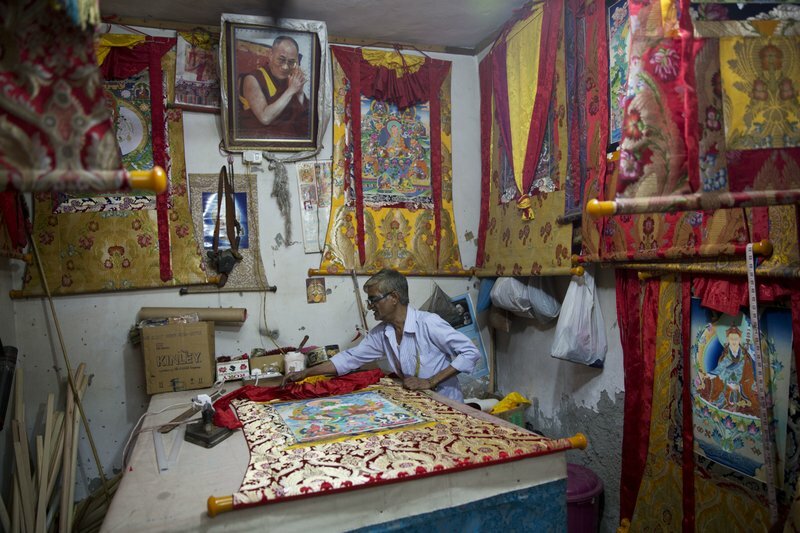 An Indian man prepares a thangka to hang on wall at a Tibetan colony in New Delhi, India, Tuesday, April 4, 2017. India said Tuesday that China should not interfere in its internal affairs, as the Dalai Lama began a weeklong visit to India's remote northeast that Beijing has protested. 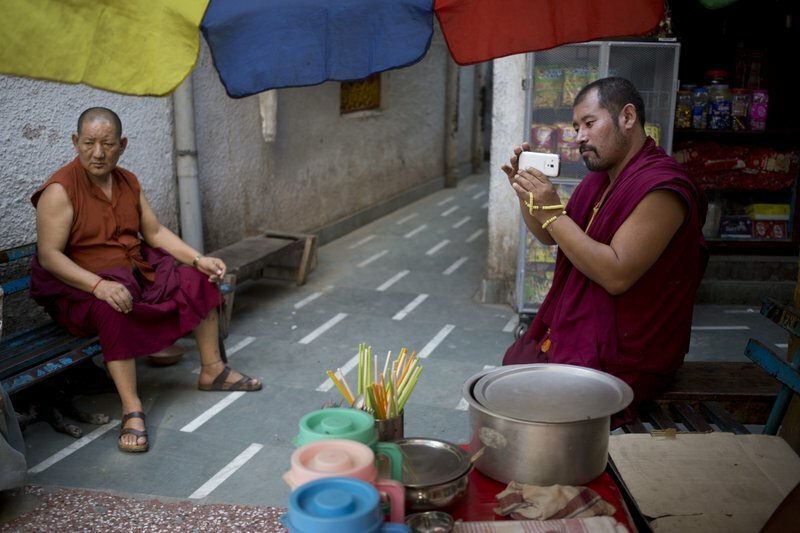 An exile Tibetan monk takes pictures on his mobile sitting outside a temple in New Delhi, India, Tuesday, April 4, 2017. India said Tuesday that China should not interfere in its internal affairs, as the Dalai Lama began a weeklong visit to India's remote northeast that Beijing has protested.